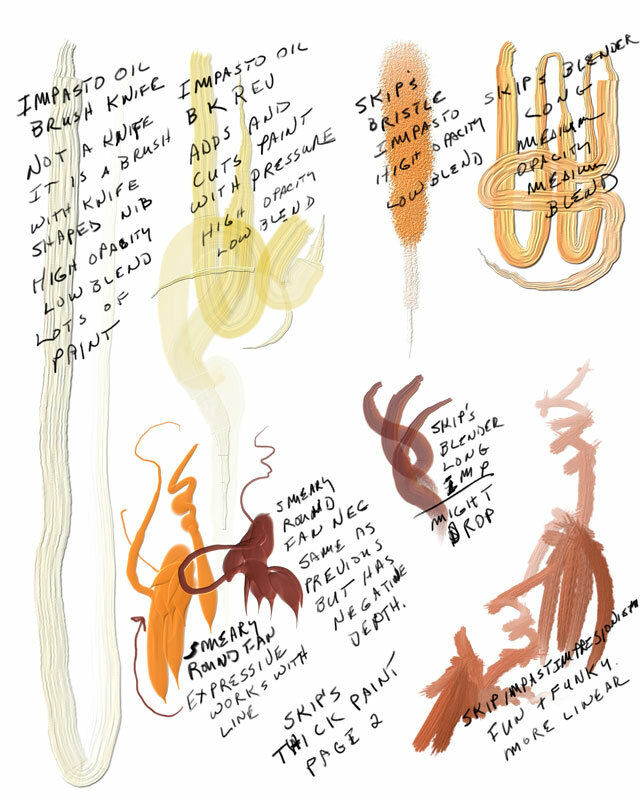 Here is another set of brushes. 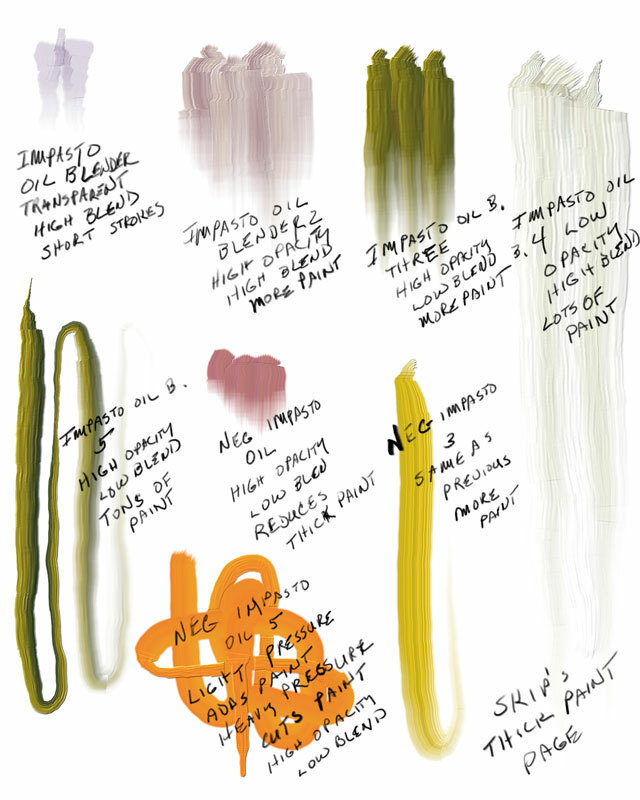 These are impasto brushes; I am still not very good with them, but I do find them fun to use. I was trying to paint thick paint on the canvas and then try to scrape it with something like a palette knife. It can be done with these brushes, but I find it is difficult to control. 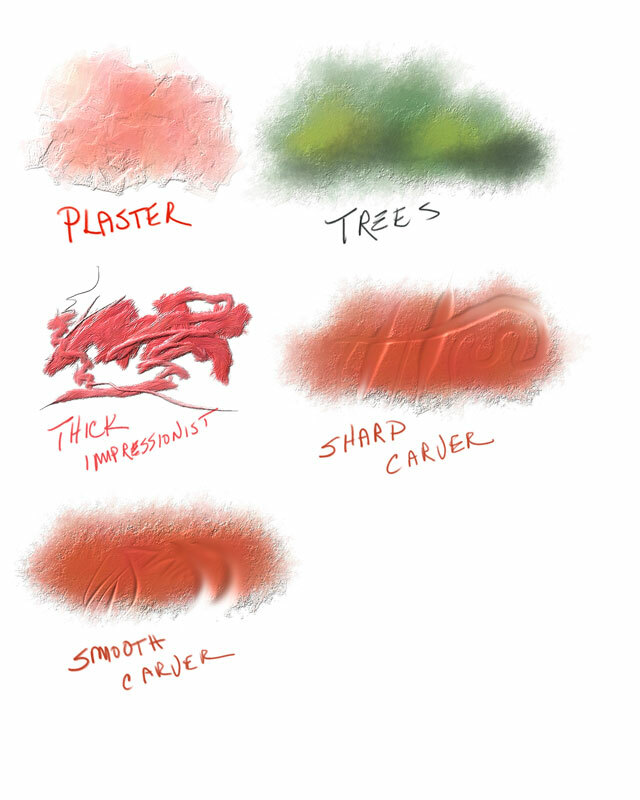 Here are some examples of the brush-strokes. The image is gorgeous. I am so glad you are enjoying the brushes. Hope everyone takes a minute to check out your blog. Thanks for letting me know. I have updated the link, so it should be ready to go. Very nice brushes! Thank you! I finally had a chance to try these out in painter 12.1…I love them! Even using some of these brushes with a low opacity and zero saturation over an existing painting can create some very nice finishing effects. I’m so glad you are enjoying the brushes and tweaking them to work for you and your workflow. I wish everyone would do that. If you like Skip’s Thick Paint, I bet you will like Bristly Dabs. You are welcome! Thanks, I’ve had some fun bristly dabs, too. Painter is an expensive but versatile software, so everyone should honestly take the time, not only to paint with it, but to tweak the brushes and create some truly amazing effects. Glad you had fun with Bristly Dabs. I know somewhere you told or made a video on how to get all of the brushes into painter 12 ;(( I have lost the link, and can only put one set of your brushes in at a time and then it kicks out the painter 12 brushes. Could you lead me to the help getting all your brushes in my brush area so I don’t have to keep loading them as needed PLEASE.. There are two downloadable type files. One would be “name”.brushlibrary and the other “name”.brushcategory. Name is the name of the brushes. If you have downloaded say…Cool Spring.brushlibrary, then it creates a new library in Painter and switches to that library. You can only look at one library at a time, but all libraries are still there. To change between libraries, click on the brush selector, which opens the brushes drawer. On the top right of the brushes drawer, you will see an option button. Click the button and a fly out menu will open. Look down the list to Brush Library and click on it, which will open another list…the list of libraries. You should see Painter Brushes, the default library; Painter 11 Brushes, contains brushes as they were in Painter 11; and Cool Spring. 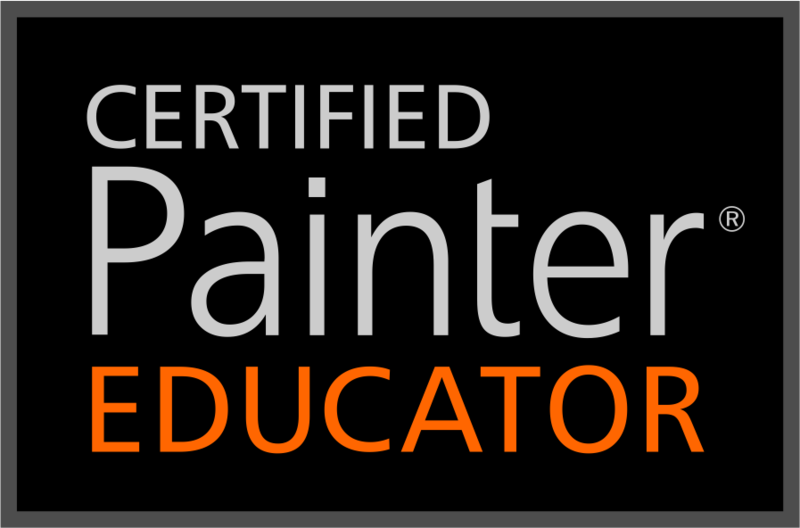 You are currently on Cool Springs, so click on Painter Brushes and the Painter Brushes will be back. I’m pretty sure you are not doing anything wrong. You just didn’t know how to re-open the default library. Once you have all the brushes installed. You can pull one brush from each library on a custom palette. Then to change libraries, all you have to do is click on the one brush in the custom palette and Painter will change to its library. To find a video or something on the subject which is of interest…in the blog banner is a search function. Type Brush installation and it will bring up the videos or pages related to brush installation. You probably could even enter .brushlibrary, but I’m not totally sure about that. I don’t mind pointing you in the right direction, but I notice you posted at 4:15 and I am just now checking comments. Using the search function will get you to the information quicker. Thank you so very much Stephanie. I appreciate your donation. I’m hoping to enhance the blog to make it more interactive. Your donation will go to help fund that endeavor. Plus, it is so exciting to have someone think enough of the blog to make a donation. It definitely makes my day. Thank you very much for the Thick Paint Brushes, Skip. I’m having a lot of trouble with them. They feel like I’m painting with wire. I’m really looking forward to covering these in class. I’ve had so much fun with class so far. You have opened up so many possibilities in Painter, I just can’t believe it! What a fantastical class, Skip. Bravo for you!!!! Too funny, Skip. I should read before I download. These are impasto brushes you made a long time ago that I already had! Thanks again or double thanks or whatever. Back to class. Thanks Kerry…I did get a chuckle when I saw your post. Yes, these variants were created before the current new technology…and I was just using the term thick paint, which didn’t relate to anything created by Corel. Something similar happened with my brush category called Real Watercolor, which was created prior to the Corel category called Real Watercolor. But any similarity between the names is strictly coincidental. Hi Skip … these look yummy!!! I was actually on the prowl for something else entirely but had an “OO something shiny!” moment when I found these … can’t wait to play … have already tried them out and am sure I’ve found several new favorites … love “Plaster” … so just wanted to say thank you, once again!!!! Hi Skip, long time no see. I was just looking at and noticed a painting done by Georg Ireland that nearly took my breath away. He used these (your) thick paint brushes and they worked really well for him. The advantage of these brushes over the 2018 Thick Brushes is that they paint on a regular layer which the Thick Paint ’18 brushes. My question for you is, would you choose to use the new Thick Paint brushes over your own set which you are so generously offering to us here? thank you for ALL you do! It truly makes this venture very fun.